Place the condensed milk and After Eights into a small saucepan and gently heat stirring from time to time until the chocolate has melted and you have a thick chocolate sauce. Remove from the heat & allow to cool. Place the cream and milk into a large bowl and whisk until it thickens and holds a soft peak. Gently fold in the chocolate mixture. Spoon the mixture into shot glasses and put in the freezer for at least 6 hours before serving. Decorate with an After Eight and serve straight from the freezer. Sprinkle gelatine over cold water in a small bowl, stir and let stand for 1 minute to soften. Add boiling water, stir until gelatine is completely dissolved. Let stand to cool. Stir together sugar and cocoa in a large mixing bowl and add heavy cream. Beat at medium-high speed until stiff peaks form. Gradually pour in Bailey’s, vanilla and gelatine mixture, beating continuously at high speed until well blended and soft peaks form. Spoon into serving dishes and place in the fridge to chill. (For a faster setting mousse, chill bowls before filling). Chill for 1 hour or until ready to serve. First make the pastry. Beat the butter and sugar util just combined. Add the egg and beat again for thirty seconds. Add the flour and mix for a few seconds until the dough just comes together (add 1 tablespoon of cold water if it seems too dry). Knead lightly on a floured surface, then shape into a flat disc. Wrap in cling film and chill for thirsty minutes. Preheat the oven to 190C, gas mark 5. Lightly grease ten 8cm fluted loose-bottom mini tart tins. Roll out the pastry as thinly as possible on a floured work surface and cut out 10 small discs using an 11cm, flutted cutter. Line the tins with the pastry, allowing it to overhand the edges, then prick the base with a fork and rest for 20 minutes in the fridge. (they should be really firm and cold so that you can avoid having to blind bake them). Bake the rested tart cases in the preheated oven for 12 minutes until golden brown. Use a sharp knife to trim off the excess pastry, then cool the cases in their tins on a wire rack. While the tarts are cooking, make the peanut brittle. Line a baking sheet with grease-proof paper or a lightly oiled sheet of foil. Put the sugar into a dry frying pan over a medium-high heat for 3-4 minutes and allow it to caramelise without stirring. Once the caramel begins to form, swirl it around the pan to ensure it colours evenly. After 2-3 minutes, when it’s beginning to turn light brown, add the peanuts and swirl to coat. Pour onto the prepared baking sheet, tilting it so that the peanut mixture spreads out thinly and evenly. It should harden almost immediately. Set aside for about 10 minutes to cool. Meanwhile, make the chocolate ganache, Put the chocolate, cream, butter and sugar into a heatproof bowl and place over a pan of fently boiling water for 7-8 minutes, stirring to combine once melted. (Taste and add a little sugar if you prefer a sweeter ganache). 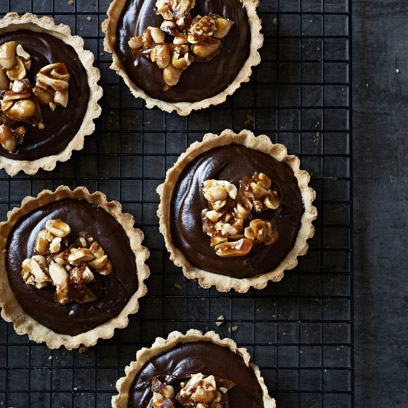 Spoon the ganache mix into the cooled tart cases and top with broken shards of peanut brittle. Chill for 20 minutes, the serve. In a bowl combine the four, sugar, butter, cocoa powder, baking powder, eggs and mix for 5 minutes until the mixture is light and smooth. Spoon into a lined pudding tin and bake for 45 minutes, or until a skewer comes out clean. Set on a wire rack to cool. Turn the cake out onto a serving plate and cover with the buttercream. Decorate with Malteasers and drizzle over the melted white chocolate. Add the cherries to the top with a bay leaf, sprinkle with edible glitter and serve. To make the base: Melt the butter in a small saucepan. Put the biscuits into a plastic food bag and crush to crumbs using a rolling pin. Add the melted butter and mix until well combined. Tip the biscuit crumbs into a 23cm spring-form cake tin and press down until firm, Use the back of a spoon or glass to smooth over, place in the refrigerator to chill whilst you make the filling. The make the filling: In a medium bowl beat together the cream cheese with the icing sugar until softened. In another mixing bowl, whisk together the cream and vanilla until soft peaks form. Fold the cream into the cream cheese mix. Finally, fold through the chopped chocolates. Spoon over the biscuit base and smoother over with a spatula or pallet knife. Cover and leave the cheese to chill in the fridge for at least 6 hours or overnight. Once the cheesecake has set, place the chocolate hazelnut spread in a small saucepan and melt over a low heat for 3-4 minutes until runny - be careful not to boil the Nutella or overheat. Allow the Nutella to cool slightly before spreading or drizzling over the top of the cheesecakes. Finish by decorating with the chocolate and a Ferrero Rocher. Serve chilled.